Anapolon (Oxymetholone) Abdi Ibrahim a characteristic feature of the preparation is the combination of its strongest androgenic and anabolic features. Anapolon 50 gives the possibility of reaching huge gains of muscle mass and strength in short periods. Even after 2 weeks of Anapolon usage you may achieve weight increase of 5 to 7 kg. The preparation doesn’t provide qualitative muscle mass gain since the liquid is accumulated in the organism. Anapolon 50 is a good possibility of quantitative muscle gain which is necessary for the athletes during the period between the seasons. Anapolon causes essential red blood cells (erythrocytes) number increase and oxygen flow increase to the muscles during the trainings. Anapolon application increases the stamina of the muscles in some times. Besides these, Anapolon Abdi Ibrahim preparation provides quick effect of “pumping” for definite group of muscles and after minimum number of approaches the muscles are so clogged that the sportsmen pass to the trainings of another group of muscles. The characteristic for Anapolon steroid is in its ability to provide high body regeneration and that is why “over-training” of the athletes that use the preparation, is absolutely excluded. Anapolon preparation, even after a hard training, gives the athlete the feeling that he is full of energy and strength. It should be noted that the price for Anapolon doesn’t exceed the average cost of the steroids and at the same time the preparation excellently keeps the muscle mass even at limited nutrition. Anapolon steroid is known since 1960. The preparation was sold freely for some decades but at the beginning of 90’s it came to be hard to purchase Anapolon because the production of the steroid with the active substance of oximetholone was stopped. Now the situation changed and everyone who wants can purchase Anapolon Abdi Ibrahim. 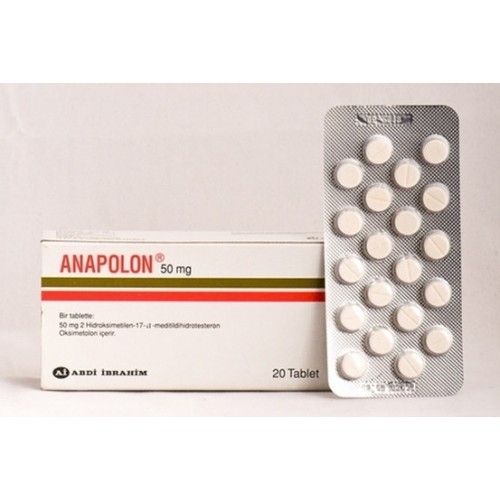 Anapolon preparation is produced in tablets and this essentially simplifies its usage but implies additional load for the liver.